Only after being victimised do most people realise the importance of taking every possible precaution to protect identifying documents from predators. A large percentage of victims are chagrined to learn that trusted family members or close associates were desperate enough to victimise them for financial gain. Identity theft is prevalent, because it often goes unpunished. Many large businesses fully expect to lose a certain percentage of profits to theft and fraud. Consequently, companies that are able to pass their losses on to their customers sometimes devote only cursory efforts to deterring identity theft. Most businesses are effectively able to absorb the losses they don’t prevent, and they can’t afford large investigative staffs. Companies often become attentive to identity crime only if the financial impact is significant. A business with a loss prevention department may consider efforts to prosecute offenders worthwhile only if the fraud is easily solved and the time spent obtaining restitution from the guilty party is minimal. Investigating identity theft is arduous. The crime can easily occur in a law enforcement jurisdiction far from the home of the person whose identity was stolen. Increasingly, phishing scams and credit card fraud originate abroad. Anyone whose identity has been stolen knows the damage and disruption seem endless. To document a fraud, there are dozens of calls to make, reports to complete, and affidavits to sign. A victim can expect to devote many excruciating hours to the business of re-establishing account status and accurate credit ratings. Understand that the company suffering the financial loss is the primary victim. In many, but not all, cases of identity theft, the person whose identity was stolen is not held responsible for debts incurred as the result of fraud. If the debt is written off, the retail merchant or financial institution absorbs the loss. You may be able to persuade a company to pursue criminal charges against an identity thief, but only if you, the police, and the defrauded business cooperate in the investigation. If your identity was assumed by someone who committed a crime or received a citation, you’ll need to enlist the assistance of the police. Take identification, such as your driving licence or passport, to the police agency in whose jurisdiction the crime was committed. Ask them to fingerprint and photograph you and compare your fingerprints with those of the violator who used your name. If someone arrested in a foreign jurisdiction assumed your identity, your local police department should contact the law enforcement agency in the foreign jurisdiction and request an investigation to clear your name. Check with the Driver and Vehicle Licensing Agency to determine whether the law violator requested your personal data or was issued a driving licence in your name. You’ll ultimately need to have official arrest and conviction records amended. You may need to hire a criminal defence lawyer to assist you with the procedure for correcting court records. Your name will remain associated with the criminal offender’s name as an alias indefinitely. 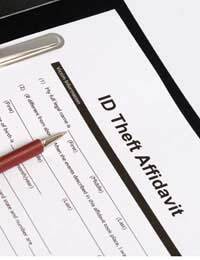 You should obtain official documentation of the identity theft to carry with you at all times. It could save you from going to jail for someone else’s crimes. You could easily find yourself submitting to fingerprinting to prove your identity on more than one occasion. Don’t be surprised if you seem to be the only person who cares that your good name was besmirched. The responsibility for repairing your reputation or your good credit rating remains yours alone.